I went to my appointment at the NYEE Hearing Aid Dispensary today but I didn't have high hopes. I have been told repeatedly my hearing loss is too severe to be aided by traditional hearing aids. Yet my ENT pushed for this appointment before my cochlear appt on Friday so into the city I went. The audiologist ran through two options I've become familiar with through my incessant reading the past few months: the BAHA headband and the soundbite tooth "transmitter thing." Since my hearing is this far gone I am really only eligible for machines which relay sound from the left side of my body to my right ear so it can do double duty and interpret everything. The baha headband is what I tried on for a few minutes in the doctor's office a month ago. The sound was mechanical. I couldn't even find a good picture of an adult wearing it because a lot of people opt to have a metal magnet implanted under the skin and then attach that little circle to it. Think that sounds bad? Originally it was screwed unto a metal "nut" which was implanted into the skin. If you're as likely as me to mis-thread a regular old household screw feel free to google and shudder at that. Side note: if you ever google all these specialized listening devices you are going to find most models are smiling babies. I guess companies are trying to make their stuff look cute but really it just looks disproportionately huge and sad on a tiny little perfect head. The only positive to the headband is it is fully covered by insurance companies who do not consider it a hearing aid (more on that later). Next up was the Soundbite - a quirky little device which clamps my back molars and also uses bone coduction to ... conduct... sound. 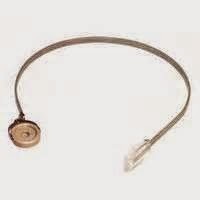 It works in conjuctions with an external hearing piece which hooks unto the back of the ear. Remember all the issues I had in 2009 when my wisdom teether were extracted? Since then I've brushed, flossed and crossed my fingers I never have to think of those things again. The audiologist says her patients with it are "meh-ish." I forget her exact wording but the gist is they think its just ok. Battery life is only 6-8 hours so it needs to be removed and replaced at least once a day. The device costs $6000 and is covered by insurance but the dental fee ranges around $700 and the mapping fee by NYEE is $700 so out of pocket its $1400. Lastly I was surprised to hear about a cross hearing aid by Widex. That's me wearing a dummy non-functional model. It works by having two identical hearing aids - one is the transceiver and the other a receiver. She's only worked with 5-6 patients with it in the past year - which according to her is a large number for newer technology and also factoring in the small number of people with single sided deafness but all have raved about it. 1. It has omnidirectional microphones so I will be able to tell WHERE sound is coming from! Since all hearing is currently handled by my right ear it always sounds like all sound is surrounding me at all times. Without visual cues (knowing the person talking is on the right or the phone is ringing from the shelf on my left) I am normally lost when tracking sound. Its disconcerting. 2. It can dampen background noise if someone is speaking. Most vocal ranges fall within a narrow frequency so if someone talks it will lower background noise and I can focus on what they are saying without hearing everything else at the same volume. I've gotten better at tuning out background noise by angling towards the speaker but its not ideal and requires more concentration. A lot of these books and sites say hearing loss leads to early dementia because your body is so focused on hearing it doesn't devote as many resources to memory. Considering half my grandparents succumbed to alzheimer's and I plan to live for at least another fifty years I better exercise that brain! 3. Its less cumbersome than all the other options. Asides from the headband all the other options require a behind the ear receiver of some sort and they all look about the same (as if I refuse to let go of my bluetooth from 2009). The Widex model has me wearing one in each ear but I'd rather wear a second ear piece than a mouth piece or an implant under my skin. So the downside is insurance won't cover it but its not that expensive - $1306 for the receiver and $875 for the transceiver. I'd have 45 days to wear them and if I don't like the system I can return it for most of my money back. Each set is custom made plus there are checkups to balance mics, ensure wire length is comfortable, etc so $300 is non-refundable. Seems fair. I was looking on-line and they have Widex vendors in NJ so I may shop this around locally. I would like to try on a working model (even if its not my exact size) and if price is comparable I'd rather go with a place I don't need to cross state lines to visit for check-ups.